Sign up for Broadjam today to follow Joe and Myrna Sokolinsky, and be notified when they upload new stuff or update their news! 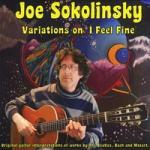 Joe Sokolinsky is a guitarist, composer and songwriter. In the past, Joe has written and performed humorous, satirical songs. He composes and performs instrumental guitar pieces combining influences of classical, new age, rock and folk music. Myrna Sokolinsky is new to writing lyrics but has long been a writer of light verse. She is an admirer of lyrics by the Beatles and golden oldie lyricists like Ira Gershwin. The album, Five Songs by Joe and Myrna Sokolinsky, contains songs with melodic, catchy tunes by Joe and fanciful, whimsical lyrics by Myrna. I just listened to your songs on BJ. I really like your tunes, especially Rhondo Alla Turca and Fugue in D minor.I live in Grafton, WI.